Podcasts are so in right now, and for good reason. Whether it’s for news, interviews or inspirational stories, podcasts have become one of the most popular mediums. You can listen to episodes anywhere, anytime - nd best of all, they’re free. 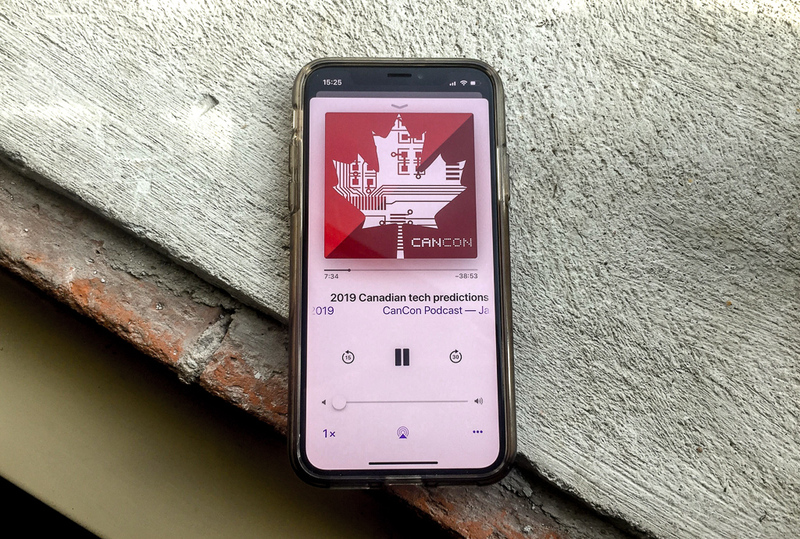 Fortunately for us Canadians, there are a considerable number of tech-focused podcasts, some of which are new, and some of which have been around for 10+ years. Below we list five options to get your brain firing whether you’re commuting, working, exercising or lounging around the house. The Globe and Mail tech journalist Takara Small shares the stories of Canada’s most influential figures in the technology scene and unpacks their experience of what it’s like to be an industry trailblazer. With a Canadian-focus, you’ll hear about the fascinating stories behind CEOs and entrepreneurs and how they got to where they are today. Recent guests on I’ll Go First include Bunz’s Sascha Mojtahedi, Ritual’s Ray Reddy, Flytographer’s Nicole Smith and [Coinsquare’s](https://twitter.com/Coinsquare?lang=en_ Cole Diamond. Most episodes are 20-30 minutes with some extending into a longer format between 35-50 minutes. BetaKit, a media company that reports on Canadian startup and tech beat, has more than 100 episodes as part of its CanCon Podcast dating back to 2016. The weekly podcast covers the latest notable news from the Canadian tech industry as well as takes a deeper dive into global tech topics that are currently relevant. Each episode is 45-75 minutes. Note: Betakit operates within Devhub, Lighthouse Labs’ community space for developers and tech companies, in Toronto. Canadian tech entrepreneur, venture capitalist and Dragons’ Den investor Michele Romanow hosts the Earning Curve Podcast, which gives you an intimate view at what it takes to start and grow a business. The first season of the podcast features young entrepreneurs and business leaders within 30-35 minute episodes. Geared more towards entrepreneurship, the Startup Canada Podcast continues going strong, even after 182 episodes. The show features figures from Canada’s entrepreneurship community from a wide range of industries. Each episode is a nice length at 35-45 minutes, ideal for your daily commute ora power hour at work. The weekly podcast is released each Tuesday, for anyone interested in tech entrepreneurship looking for a regular dose of Canadian-focused content.. Although recorded as a radio show, Spark is also available in podcast form. Spark takes a fascinating approach looking at the social effects of technology on our everyday lives. (One recent episode, for example, offers insight into what the Instagram egg, a plain picture of an egg that became a global phenomenon within days, says about us). The show itself has been around for some time, with more than 400 episodes dating back to 2007. You can listen to the show on CBC Radio One and Sirius XM, or catch episodes at your convenience on iTunes. What are some of your favourite tech podcasts? Tweet us at @lighthouse_labs with your go-to listens.